Medical Research Foundation, a unit of Sankara Nethralaya, records with deep appreciation, the initiatives of Chennai Petroleum Corporation Limited for successfully executing its Corporate Social Responsibility by sponsoring “Free Eye camps” in and around the villages of Manali, where the organization is located, jointly with the teleophthalmology team of Sankara Nethralaya. 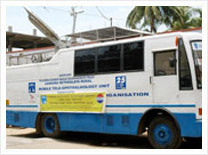 Starting from the year 2009, for a period of four years, till March 2013, a total of 43 “Eye camps” have been conducted by the Chennai Petroleum Corporation Limited across areas the neighbouring of Manali, Kosapur, Ernavur, Tondiarpet, Kodungaiyur, to name a few. Study of reports indicates prevalence of Cataract in the elderly and uncorrected refractive errors in the lower and middle aged populace. Over six thousand patients comprising the elderly (both men and women) and children were screened in various camps. Quite a number of patients detected with complications of the eye, during preliminary examination, were referred to the base hospital for cross consultations to other departments to undergo various investigations such as Ultrasound, Humphreys Fields Test, Fundus Flurosciene Angiography and Optical Coherence Tomography where these tests were carried out absolutely free of cost. About 509 patients with refractive errors were dispensed spectacles free of cost. Cataract extraction with IOL implantation, with food, lodging, medicines, spectacles and transportation (to the base hospital and back to camp site) were offered absolutely free of cost to 555 patients. The sole aim of these camps was to bring in State of art Medical technology to the doorstep of the villagers who otherwise could ill afford the same. The beneficiaries included Industrial labourers and particularly the elderly belonging to the lower economic strata, whose quality of lives have remarkably changed, making them self dependent, to earn a living or manage their daily routine. An average day for Sarojama begins at 4 a.m.; her daily chores are followed by a 45-minute drive to Kasimedu to buy fish — her only source of income. Back at Manali, Sarojama joins her fellow vendors as they begin their sales for the day. Sitting on the roadside has meant that the 57-year-old widow is constantly exposed to the sun and dust. “By the time I go home my eyes are burning and I often experience an irritation-like feeling,” she says. Off late, her eyes have been a cause of concern; she is unable to see far off things, identifying the number board of an approaching bus is no longer as easy as it sounds. 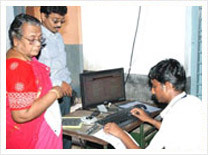 She is one among the many who came to the Sankara Nethralaya-CPCL (Chennai Petroleum Corporation Limited) eye camp, held at Manali on June 20, 2009, in the hope of finding a solution to her eye care woes. Sankara Nethralaya’s teleophthalmology department conducted a detailed eye screening for 305 patients at the day-long free eye camp and helped diagnose various eye ailments including cataract and other ocular diseases. For someone whose sustenance wholly depends on the number of fish she sells a day, coming to the camp also meant forgoing a day’s earning. “I could not miss this chance. I can’t afford to go to a hospital, neither do I have the money nor the time,” she says matter-of-factly. Manoranjitham agrees. “We are lucky that our eyes are being examined for free, not all can afford going to a hospital and paying for the treatment,” says the 46-year-old attender at the Manali government school. She too, like Sarojama, has been complaining of a burning sensation in the eye, and difficulty in seeing. Both of them represent a significant percentage of people who are the sole breadwinners for their family at Manali. Sarojama is childless and Manoranjitham’s son and daughter are leading their own lives elsewhere, leaving Manoranjitham and her husband to fend for themselves. Her husband is unemployed and her meagre earnings of Rs. 500 per month, out of which Rs. 200 goes in paying the rent for the house, is all she has to make both ends meet. While a detailed eye check up at the camp has indicated the need for both of them to undergo cataract, it’s not a case of urgency as they had been diagnosed with immature cataract. Both of them were prescribed glasses, which optometrists said should take care of their eye care worries for the time being. Being the sole breadwinners, they both expressed their desire to be operated a little latter. The cataract surgery with intra ocular lens implantation will be performed free-of-cost soon. 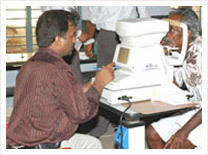 So how does a typical eye camp function in helping people like Sarojama and Manoranjitham? The first step involves filling in the personal details in the registration form, following which the patients undergo a basic eye screening test, where an ‘E’ chart, adhering to the WHO approved norms, helps test vision clarity. This screening serves as a filter to identify those who need a more detailed check up and those whose don’t. The second level of detailed eye examination includes noting patient details in the Electronic Medical Records. Here, a more comprehensive diagnosis is done for cataract, refractive error, glaucoma and other eye ailments. The patients are either recommended for surgery, or are prescribed glasses. 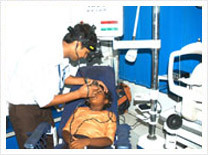 For complex cases where further consultation is required, a teleconsultation is set up with experts at the Sankara Nethralaya hospital in Chennai through the mobile rural teleopthalmology van, stationed at the camp, using satellite connectivity (VSAT) with the help of the Indian Space Research Organisation. Based on the teleconsultation with the senior ophthalmologist, the patient is prescribed further treatment. If a patient is recommended for surgery then he/she is guided to the next level of examination, where a blood test is conducted to determine BP and blood sugar levels of the patient. Following this, the patient is given a pre-surgery counselling by the ophthalmologist wherein they are told about the impending surgery that will be performed free-of-cost on indigent patients. In fact, patients who are recommended for surgery are brought to SN the very same day and an operation is performed on the next day.Patients who had problems other than cataract were referred to JCOC, the community wing of SN, where indigent patients are treated free of cost. 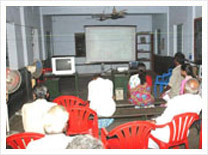 A key component of the eye camp is conducting an eye-awareness programme where patients are educated through a video presentation on eye care. People like Sarojama, are not the only ones who visit the camp, there is 14-year-old Linda who mistook her eye irritation symptoms to the need for wearing glasses only to be told at the camp that her vision was perfect! Three-year-old Akash was not that lucky. After a lot of cajoling that went in to getting the tiny tot sit still while the optometrist checked his eyes, the news was grim. Akash has myopic error of -9 and -7 in his eyes. Coming from a poor family, a visit to a free eye camp like this ensures that all hope is not lost for people like Akash. He will soon be wearing glasses prescribed for him. Akash’s case highlights the importance of screening school children for refractive errors, which may adversely affect a child’s academic performance. For 70-year-old Amsa, a widow from Nagapattinam, the case was no different. Having been abandoned by her 2 sons and 5 daughters, Amsa depends on the goodwill of her relatives for her survival. On a visit to Manali, she was brought to the camp by a relative. 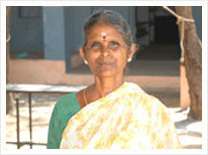 An examination of her eye revealed the need for a cataract surgery. She was taken to SN where a free-of-cost surgery was performed on her. For residents of Manali, the camp answered their many unanswered questions. A teleophthalmology camp like this one, through support from organisations like CPCL, showcases how technology can be brought to the doorstep of every poor personand how the availability of quality medical care to indigent patients,often an impossible option, can be made possible!